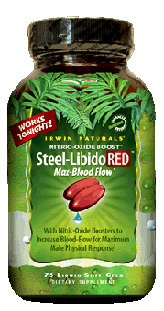 Steel Libido RED™, 75 liquid soft gels (Irwin Naturals) - Penn Herb Co. Ltd.
Fast-Acting Tonic - Works Tonight! Steel Libido RED™ works tonight! Take it daily for ongoing maintenance of health or as needed for fast-acting enhancement. It is packed with nutrients to maximize physical performance. In particular, Ginseng improves physical capacity and CoQ10 fuels energy production. When it comes to performance, Nitric Oxide is the key! Nitric Oxide is a naturally-occurring compound in the body that plays a critical role in the male response. It is produced in the inner lining of the vascular system and helps to dilate blood vessels, allowing blood flow to vital organs. Fast-acting enhancement with nitric oxide boosters to support blood flow for maximum male response. Adult for daily maintenance, take 4 liquid soft gels in divided doses. For more immediate response prior to intimacy, take 4 soft gels 1 hour before activity. SEE LABEL FACTS BOX FOR CAUTIONS.